I’ve written in the past – disparagingly, I admit – about the “full quiver” movement, those who believe it is our patriotic duty to have large families in order to ensure the future defense of our nation. 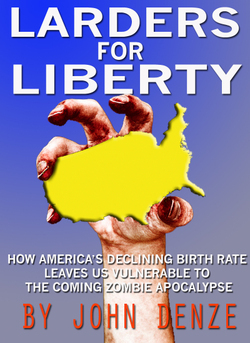 Looking back, it seems I might have been a bit hard on those folks, so in the interest of fairness I’m kicking off this inaugural installment of Blog Named Sue Book Chat with an interview I did with socio-historical critical theorist John Denze, author of Larders for Liberty: How America’s Declining Birthrate Leaves Us Vulnerable to the Coming Zombie Apocalypse. dan mcenroe: John, thanks for coming by. John Denze: Thanks for having me. dm: Your book has a fairly provocative thesis; please explain why you feel declining birth rates in America actually leave us vulnerable to an attack by zombies. JD: Well, as a socio-historical critical theorist who frequently appears on cable news programs, I think I have better grasp of the macro-picture than others might. Now, zombies, as just about everyone knows, are re-animated corpses that roam the Earth to feast on the flesh of the living. Now, in order to have a re-animated corpse, you first need a corpse. It’s obvious to anyone with two eyes and a brain that people die often, pretty much every day really, and, frankly, with America’s birth rate on the decline I think we may soon find ourselves in a situation where the dead outnumber the living. That should give us pause. dm: You know, I have to confess that I don’t worry all that much about a zombie attack. JD: That’s a very “fashionable” attitude these days. dm: You think people don’t take the threat of a zombie attack seriously? JD: I don’t see how you can argue otherwise. Our decadent liberal enclaves in the east seem to tolerate the presence of zombies among them. The depiction of the zombie in popular culture strikes me as a bit naïve; contemporary films seem to regard them as little more than cultural metaphors, or, worse yet, something to laugh about. I don’t think a zombie attack is a laughing matter. Zombies are not metaphors. They’re relentless killing machines with a bottomless appetite for human brains. dm: But isn’t virulence one of the defining characteristics of zombie-ism? By having more people around, don’t we run the risk of simply creating more zombies? JD: Well, yes. But what you’re saying actually emphasizes my point about the necessity of having a large family. dm: I don’t follow. How are your kids going to protect you from a zombie attack? They’re just kids. JD: Indeed. But one of the advantages of having a lot of kids around is that should you become a zombie yourself, you can eat your own children. JD: Of course! Look, who would you rather see eat your daughter? Some swarthy foreign zombie? JD: Look, if anyone’s going to eat my daughter, it’s going to be me. And if having more kids means creating more zombies, then I’m OK with that – because at least they’ll be American zombies. Honest, hardworking zombies. That might not be the most PC attitude these days, but that’s how I see the situation. dm: OK, we have to leave it there. John Denze, thanks for stopping by. (Nicked zombie hand on book cover from here.